I read an inspiring story in today’s newspaper about a 13 year-old, Shubham, who has recently launched a company to develop low cost machines to print Braille. He is Silicon Valley’s youngest entrepreneur. 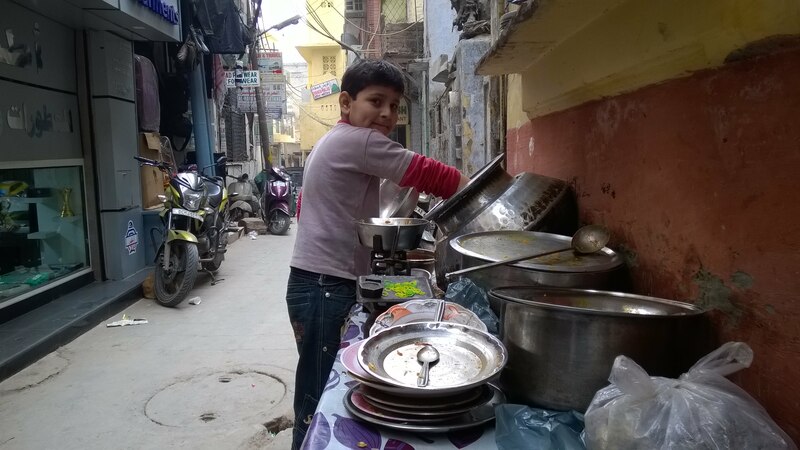 Coincidentally, I met another 10 year old, Sameer, in Nizamuddin today afternoon with a degh, selling biryani, chicken korma and kheeri. For the first few minutes, I just saw him diligently taking out biryani from the degh, adding red chutney to it and serving it to hungry souls. Every time, he removed the lid from the degh of the biryani, the aroma of the spices and kewra straightaway entered my nostrils. 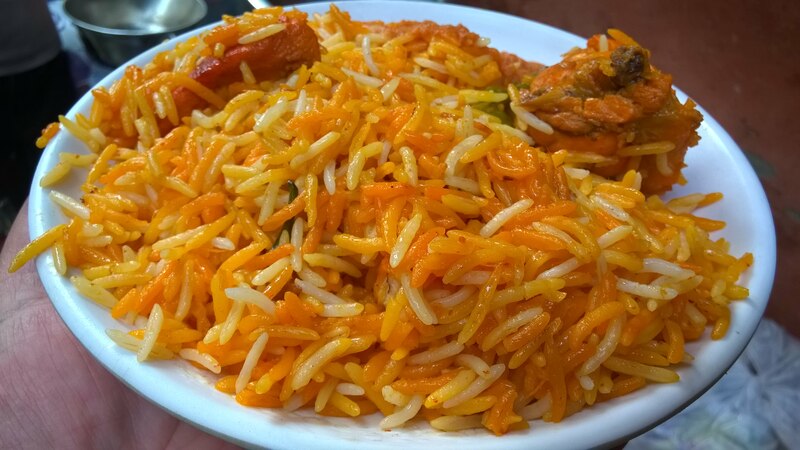 My taste buds could not resist for long and I asked Sameer for a plate of biryani. I sprinkled the masalas lying in a small plate over the biryani, mixed the red hot garlic chutney and had a small spoon of it. The biryani was delightful. I had my second spoon and started the conversation with him. There were two deghs lying next to each other. In one of them was chicken korma and the other contained kheeri. The dish kheeri is made from small pieces of a buff’s udder, and was something I heard for the first time. The curry is changed on a rotational basis everyday and ranges from achari chicken, aloo keema, aloo gosht, to matar keema. On Wednesday nights, they make special paaya, and ande ka kofta. On Friday afternoon, biryani is served with haleem. A plate of biryani costs Rs. 50. Most of the curries are in the range of Rs. 40 to Rs. 50 per plate. Sameer briefed me on everything about the menu. He was not very confident about the cooking, though. He was there to take care of the shop while his father was away for some work. I then asked him to introduce me to any elder person of his family. After a brief interval, his uncle Imran came and shared the journey of his shop from a small cart to counter wali dukaan. Seven years back, Sameer’s father, Shakir Alam and his brother Imran started selling biryani on a small cart outside the Markaz in Nizamuddin. The inhabitants of Nizamuddin appreciated his biryani so much that they set up the small counter and table outside his home, near Qureshi Masjid, Karim Wali Gali. The shop became famous as Counter Walon ki Dukaan. Alam’s wife, Sitara ji cooks these mouth savouring delicacies at home, not once, but twice in a day. Alam sells these dishes during the afternoons (1 p.m to 4 p.m) and evenings (7 p.m. – 11 p.m.). Their mobile numbers are 7503626266 and 9555000489. Imran informed me that Sameer got admission in another school, the session will start next month in February. Indeed, he is an entrepreneur in the making, a few years down the line, he might open up a restaurant and takes the Counter Wali Dukaan to another new level altogether. Nobody knows!